I was embarrassingly late to my wine-tasting date with Jenn this past week. I had never done a wine-tasting where you make a reservation, pay $25...and the wine geek in charge ("Chairman Paul") gives a lecture. So I walked in to a quiet room with all eyes turned to the lecturer...and then all turned to me. Crap. Rieslings (or any wine, really) won't smell sweet - that's a taste. Sweet wines need acidity for balance - you want some tartness to counteract the sweet. A petrol nose is characteristic of Riesling but not always present. 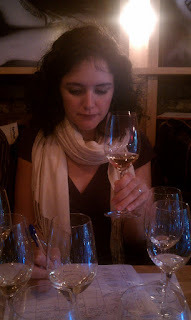 Likewise, Rieslings characteristically smell and taste of slate, granite, etc. That's speaks to terroir. I won't get into the details and notes about each wine, but Jenn and I agreed that #4 was our favorite: Riesling Pfaffenberg Rainer Wess 2006 (from the Kremstal region). It was incredibly unusual - our instructor rightly told us that you don't taste the peach fruit, you taste the pit. It was very earthy and metallic (in a good way). One of the reasons we loved it was because it was a rather odd, disconcerting wine...which made you want to keep drinking it to figure it out. It intrigued me more than the others. Our least favorite? The first wine: Riesling Rothenbart Ludwig Neumayer 2007 (from the Traisental region). It was all Granny Smith tartness and no roundness of flavor to balance it. I could certainly see where it would pair well with sashimi but, for this tasting, I wasn't a fan. Word to the wise: you might want to eat a snack before the tasting. Drinking this much wine pre-dinner was a bit of a challenge for Jenn and me...but we held it together admirably. I also want to share that this is a great class for beginners (I'd classify myself as a beginner-intermediate wine taster). I can't say if it's too "easy" for the advanced connoisseur, but I do know there was some schmuck there who kept talking over our instructor, loudly blabbing about his "wine tutor". Wine snobs like that guy are what give people who love wine a bad name. Luckily, I easily ignored him. "There is no conversation about how these wines are made. They're made in the vineyard [...] Wines are made in the vineyard, NOT in a winery. That's terroir." Eat, drink, and cheers to that!